The annual EFL Kids Cup (under 11 for boys) and EFL Girls Cup (under 13 for girls) began a couple of months ago, with EFL pro-clubs hosting both categories to decide who progresses onto the next phase of the competition. Southwater Junior Academy (Kids Cup) came through Bewbush, Milton Mount, Seymour and the Oaks, with Oriel High School (Girls Cup) progressing past Hazelwick and Holy Trinity, to both go through to their respective next rounds in Swindon and Reading. 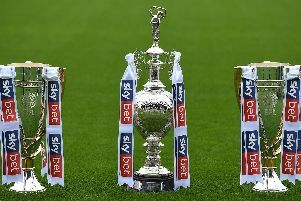 The EFL Kids and Girls Cup are national tournaments for junior footballers, which offers children the once in a lifetime opportunity to play at Wembley Stadium. Combined, the Cups involve more than 20,000 children and creates one of the largest national football competitions in the country, which culminates in exciting finals at Wembley Stadium in front of thousands of fans before a major national final. Parents, teachers and players from both schools travelled to the next stage of the competition, and we are so proud with the performances of all our teams and representatives. In the EFL Girls Cup, Oriel High School, lost three and drew two against difficult opposition. Unfortunately, they could not progress to the next round. The Kids Cup representative, Southwater Junior Academy, travelled to Swindon on a Thursday morning and managed two draws and four defeats. The enthusiasm and support was outstanding. Southwater JA @SouthwaterJA_PE tweeted this post-event: “Really proud of our boys who battled and fought so hard at the South of England finals today, they finished the group with 2 draws and 4 loses. The EFL Kids Cup and EFL Girls Cup return next year, and will include a preliminary qualifier for schools beforehand.